There’s been a lot of talk recently about brushless motors. If you haven’t heard, this alternate style of motor has some great benefits like longer runtime, fewer potential points of failure, less heat output and a more compact design. To learn more about brushless motor technology, I’d encourage you to check out the Brushless Motors 101 article from ToolGuyd. 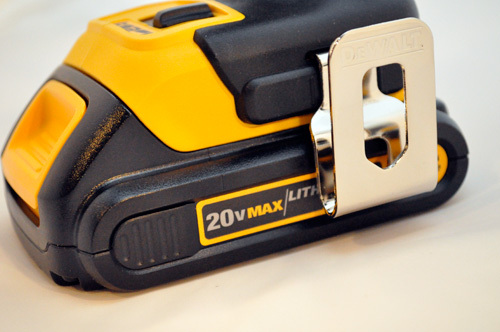 Lots of the major tool manufacturers (Festool, Makita, Milwaukee, Hitachi, Bosch) have jumped on the bandwagon, and DeWalt has just shipped us their new brushless motor, 20v Max impact driver. Here’s a first look at this new offering. 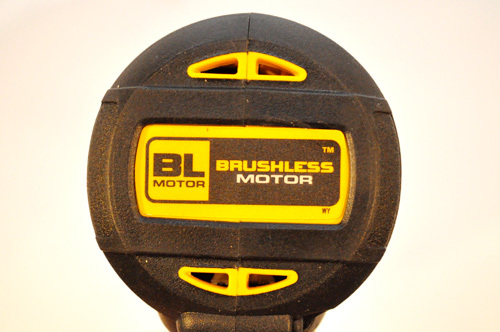 I’ve already touched on the benefits of the new brushless motor technology. 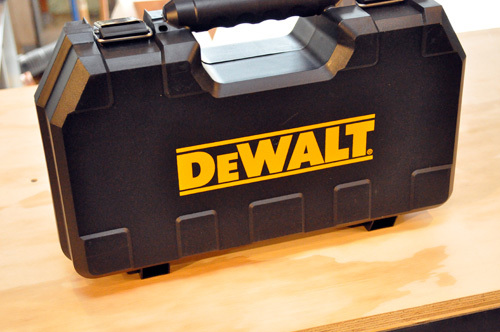 What most users will notice is the increased runtime, and DeWalt claims up to 1.5X more runtime versus leading competitors. This is a huge step forward, and some product managers liken it to the introduction of lithium-ion batteries. I expect most manufacturers will fully adopt brushless motors in the near future. That extra yellow button just above the trigger is the new chuck release. Unlike traditional chucks that require two hands, all you have to do is insert a bit, and it locks in place. To release the bit, push the yellow button. You should know that you can’t release a bit unless the driver direction switch is set forward or backward (it won’t release in the middle position). I haven’t spent much time with the new 20v Max Impact. Even so, I’ve found that at times the new chuck design can’t hold onto the bit. For instance, I drilled several deep holes with a self-feed, spade bit. On multiple occasions, the chuck couldn’t hold on while I backed the bit out. I hope DeWalt will address this problem. DeWaltincluded a 3-speed, electro-mechanical selector on the base. They feel this is better than the competition because the current speed is more readily visible. As you might expect, the lower setting (position 1) is designed for finish applications like brass hinge screws, and the speed increases as you move up. You can’t change speeds while the trigger is engaged. In my experience, the new speed selector has a few kinks. Specifically, sometimes the driver remains in speed 3 when the switch is in the second position. I’ve seen this on two different models. 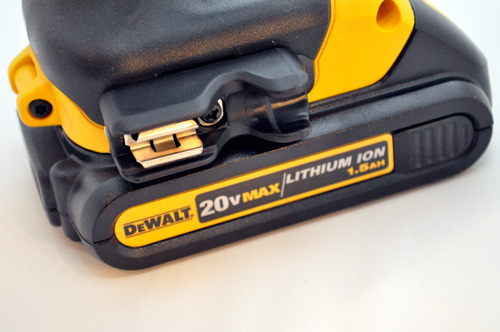 I was surprised DeWalt didn’t include a fuel gauge with their original 20v Max batteries. However, this problem has been rectified, and you can still use the same multi-volt (20v / 12v) charger. One of the other very noticeable features is the overall length. At 5.25,” it’s 0.3″ shorter than the previous model. Good post. I’ll check the 101 link later. Are there any drawbacks? As with any new technology I suspect the biggest drawback will be cost. Did DeWalt give a price point for this new driver yet? Pricing? 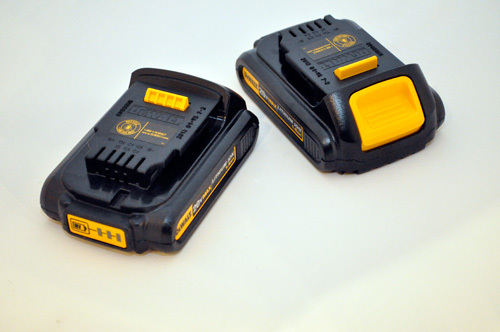 Figure on $279 for the tool + two 1.5Ah batteries. (Gulp!) Drop the Price about $100 for just the bare tool. This driver is pretty cool. I’m loving the Max Torque of 1500 in. lbs. That’ll probably snap the cheaper bits out there under full load. There’s still others in the industry that claim higher (PC has a 1.3Ah tool they claim can deliver 1600 in. lbs., but it dies really quick). The extended run-time is sure to be a hit with tradesman who do a lot of driving (think deck installers). My guess is that most hold off on a purchase until this thing comes down from the heavens. 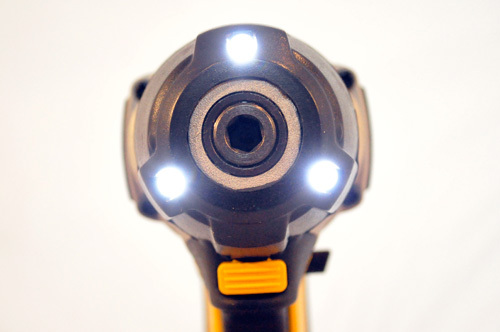 I expect within the next 24 months we’ll see an impact/drill brushless kit at the $300 level. I don’t know of any drawbacks for the BL motor. They told us the price but I don’t have that handy. Looks good. Nice drill. That new clutch mechanism may take some getting used to. 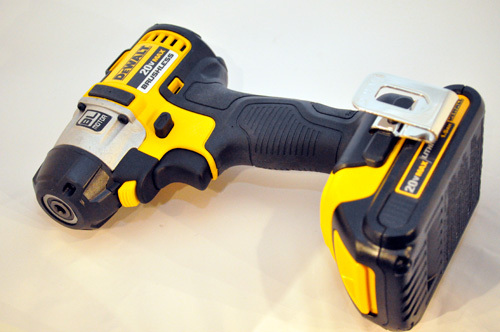 The DeWalt’s on my list of drivers to consider! 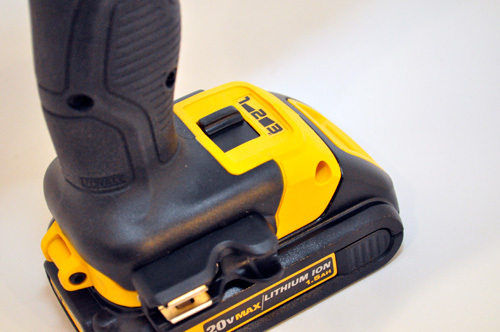 I have the 18V DeWalt impact and I love it’s power. Sometimes it has too much though. It will twist off tapcons with little effort. I think the speed/power selector is my favorite feature of this new model. Hopefully the bugs get ironed out of this model. I’ve been enjoying my Ridgid 18V model pretty well. We’re hoping to derive a torque test to put the Ridgid brushed motor 18V against this new guy – just need to buy some really thick screws. Any suggestions for rigging a test apparatus? I liked Dewalt’s doubled up composite material they used in a promo video. That way you know the material is consistent. You can’t get that with normal construction lumber. Here is the video with the setup. Does the new chuck design require you to use a certain style bit? That was my first thought too…will we have to be buying new bits for this model or will all of our current ones fit into it? No new bits and it even accepts those 1″ bits. Cool. Looks very small. Probably not worth upgrading if you’ve already got a perfectly functional drill already, but always cool to see what you’ll be buying next time around. I’m excited about the BL motor but concerned about the chuck. Hopefully they can work out the bugs. Look for a full review in the coming days. This tool is a good complement to a drill if you do a lot of driving. 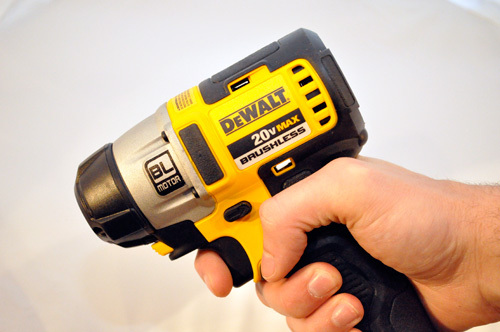 An impact driver doesn’t transfer torque to the user, which is different than a drill driver which will twist you right around in most cases. The chuck looks like it would get jammed easily if it gets dirty or the bit isn’t quite straight. I am a big fan of the new BL technology though and can’t wait to see what they put it into next. You’re paying a big premium for the Brushless Motor in this guy. Brush motors really do work fine — in fact, until about 12 months ago they were all we really had. 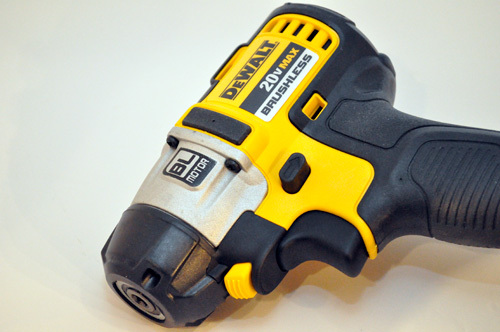 You can get a DeWALT 18V Drill/Driver/Impact Combo kit for < $200. Does the speed switch only switch speed, or does torque also change with the speed? 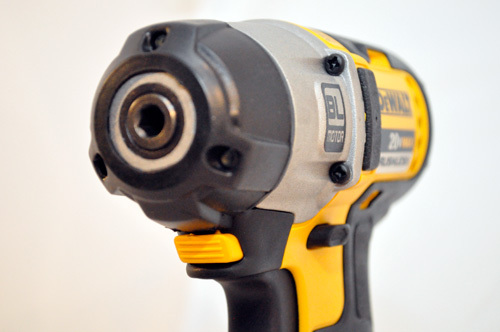 Having never used an impact driver, how easy is it to overdrive screws? I know that with a drill/driver, it’s sometimes pretty easy to set the torque too high and push a screw too deep. The speed selector changes speed and torque which is why it’s so great for finish work (like the brass screws) where you don’t want to inadvertently damage something. I’d say that it’s just as easy to overdrive a screw as with a drill/driver. Just picked up the new Milwaukee Fuel brushless impact driver with the 1.5 AH batteries. I have to say I’m not super impressed so far. The batteries seemed to die much quicker than I would have expected (granted I was using it to drive 8″ TimberLock screws through the edge of 2×6 rafters on a pergola). It got hot pretty quick (unlike my old Makita 14.4V impact driver which struggled with the 8″ screws but didn’t generate as much heat, which is odd given one big selling point of brushless is less heat generated). And I’m not a fan of the collar on the chuck. It’s fat and there’s no release spring to pop the bit out so it’s a little hard to operate one handed which I was able to do with the Makita despite the lack of these features and have absolutely no problem with on the 12V Dewalt impact driver or screw driver. In short I’m looking hard at the Dewalt brushless now. Any experience driving long screws with this? 6-10″ timberloks and the like? Any news on the issues with the chuck and the speed selector? it will be interesting to see if this is simply a fad or truly an improvement in the long run… but for now i really enjoy my hilti 18v impact….